He was a little surprised when I responded with a “no”. I said, “I have big plans for 2017, I don’t think I need any resolutions.” A comment easily thrown out there in pleasant conversation, but today when I thought about my big plans for 2017, I realized it is 2017. Then I started to think about all the stuff I still had to do and panic quickly followed. I have officially been planning this hike for 41 weeks. That’s 75% of my planning and preparation time already used up, and I still have so much to do. Where did the time go? I stop and breath then remind myself that 15 weeks is three and a half months, which is still a good chunk of time to get things done. What if I can’t get a permit for the day I want? I didn’t understand how the long-distance permit application process worked and was afraid that the date I wanted might be so popular that I wouldn’t get it. I’m assuming this has never been a problem, since I can’t find anyone who says it has been. Plus, after some research, I found out that I get to choose the date when I apply. Panic alleviated. Every time I get new gear, I fill in all the information on my spreadsheet, but I’ve never physically laid it out. So, I decided to do just that. 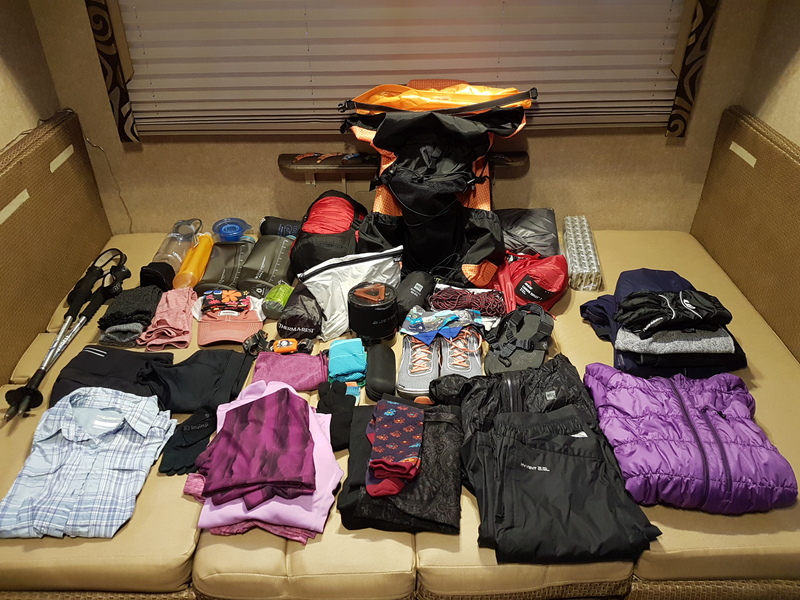 Once I actually laid out my gear, I was able to see what I have, what I still need, and how it all fits in my pack. It turns out I’m only missing about 10 items. Not as bad as I feared. It worries me when I look at the types of food people eat on the trail. I don’t generally eat junk food or really anything I can buy at a gas station. I’ve considered dehydrating all my meals, but I live in a very small space, and the amount of food I would need for the entire hike would take way too much time and space to prepare and dehydrate. I’m still trying to decide whether to buy bulk items or pre-packaged entrees to have sent to me. Also, it’s hard to determine if it will be less expensive to ship stuff from Canada or pay the exchange rate when buying locally. For now, I just need accept that I have more research to do. How do I pay for everything? 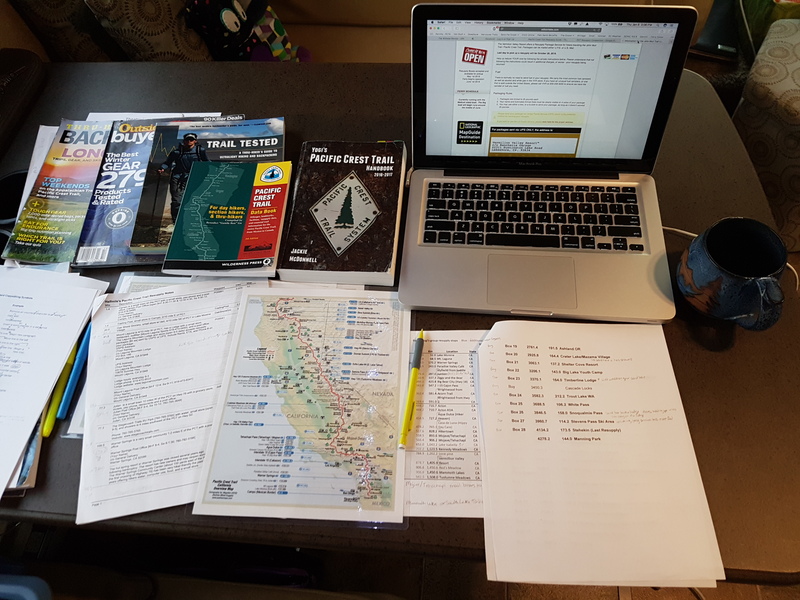 It’s no joke, thru-hiking the PCT costs money. Like many, I worry about how I will pay for gear and all the on-trail expenses. One way is to find sponsorship. There are several ways to do this, but what I did was approach the Canadian version of REI, known as Mountain Equipment Co-op or MEC. As it turns out, MEC gives people the opportunity to apply for Expedition Support (www.mec.ca/en/explore/expedition-support). There are criteria and application deadlines (Feb 1 is the next one), but they provide an outline for what you need to submit, and it was straight forward and easy to do. 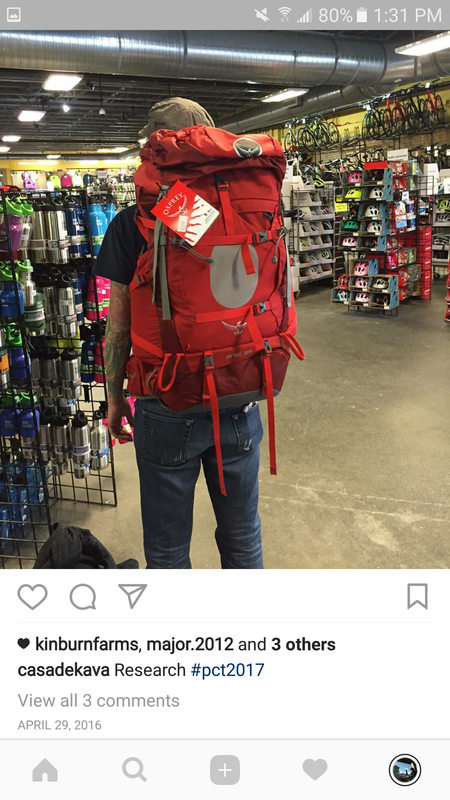 As well, if you don’t already know, The Trek just announced the Badger Sponsorship. You can find more information about this amazing give-away here: thetrek.co/announcing-badger-sponsorship-2017. Thankfully, my husband, Tim, is in full support of my adventure and is more than willing to be my resupply guy. Only, I still need to tell him how that’s going to work. I’m overwhelmed by the amount of information out there. Where to resupply? What to put in my resupply boxes? Where should I send boxes? I realized, again, that if I just focus on one thing at a time, I will get through it all. When I get overwhelmed, I take a break and do something different for a while (not to be confused with resistance). Like the trail, it’s one step at a time. Ok, let’s do the math: 15, no 14 ½ weeks minus 9 equals 5 ½ weeks. Breath, that still leaves 6 weeks before my start date. And, if for some crazy reason, it doesn’t get here in time, I still have my back-up sleeping bag. The truth is I’ve been hiking and working on my core for a while, and I still have 15 more weeks to work out. If all else fails, I won’t be the first to start the hike not in prime physical condition, and I don’t need to hike a 20 mile day the first day. 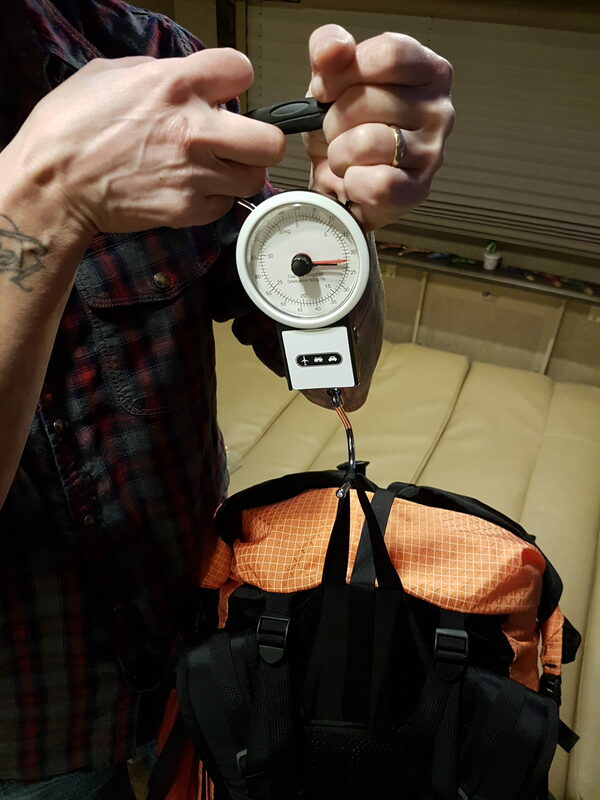 I’ve carried many heavy backpacks while travelling, so I’m well aware of how much weight I don’t want to carry. Trying to balance a lower base weight with the desire to have certain comforts, such as a stove and a two-person tent, gets me anxious. I’m still not sure how this is going to work out. I really want my base weight to be under 20lbs, but right now, it’s more in the range of 25lbs. The thought of leaving behind any of my current choices still makes me uncomfortable. I hope as I get closer, I’ll be able to let go of potentially unnecessary items. Basically, there’s no real need to panic. I just have to accept the reality of the moment. When panic comes up, instead of wasting time worrying, I need to stop and look at what’s causing the panic. Then I can figure out what I can actually do right now to alleviate it. Also, I can always trust that, in the end, it will all work out somehow.